Welcome to our review of Rocket Pure Natural Foot and Shoe Deodorizer Spray. This product aims to help prevent anti-fungal infections and other foot related conditions by keeping your feet clean and feeling fresh. It can also be used to disinfect footwear which is one of the leading causes of fungi growth. If you wish to know more about this anti-fungal preventive spray, read on below for our detailed review. Before applying this spray it is best to make the proper preparations first. Clean your feet with soap and water, then dry them off thoroughly using a clean cloth towel. Before using the spray, make sure to shake it well as compounds tend to separate after not being used for a while. Spray a light layer over the affected area and gently rub it in to help the skin absorb it. Spray it a couple of times inside your footwear as well. This helps eliminate odor as well as bacteria and fungi build up. While relatively safe for use, the Rocket Pure Natural Foot and Shoe Deodorizer Spray uses several ingredients that are considered to be powerful compounds that can cause skin irritations. For those with a serious case of fungal infections, this product might also be ineffective and might cause severe burning sensation upon contact. One bottle of 120 ml. 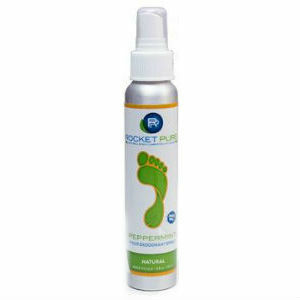 Rocket Pure Natural Foot and Shoe Deodorizer Spray currently costs around $15.95. If used daily, it will usually last around 2 months. It is available on their official website as well as most online stores and pharmacies. The official website offers Rocket Pure Natural Foot and Shoe Deodorizer Spray with a limited lifetime return policy. This is a great deal especially if you find that the spray does not meet your desired results. You can return the product and get a full refund or a replacement product of your choice. You can contact their customer support services to get the details about the return policy. The Rocket Pure Natural Foot and Shoe Deodorizer Spray offers quite a nice bargain when it comes to price and guarantee. However, it should be noted that this is not an anti-fungal treatment and is merely used as a preventive measure to stop fungi growth and bacteria. There are also several customer complaints that concern its effectiveness as a deodorant. Several comments claim that the spray merely hides the odor for a short amount of time but does not permanently eliminate it, thus, making this a temporary cure for foot odor. Jimmy Rodriguez	reviewed Rocket Pure	on November 19th	 and gave it a rating of 3.